One could say “From Zero to Hero” in terms of location. From the quite and peaceful embassy district to the most vibrant place of entire Madrid: Plaza Espana. With the Gran Via connecting the square with the old town, the VP Plaza Espana has one of the city’s most strategic locations. Being a 17-story tall building, the hotel’s upper floor rooms have stunning vistas of the old town including the Opera house, the Royal Palace and to keep it short: the entire city. We arrived by Cabify from the other hotel we stayed before and were welcomed by the bellmen of the VP Plaza Espana Design who immediately showed us the way to the front desk. A young team of staff members were making up the front desk and check-in was nothing spectacular with handing over the keys and indicating the way to the room. There was no tour to the room, nor a welcome drink or introduction of the location on the city map. Generally I know this welcome from Sheraton, Hilton or Marriott so I knew how to categorize the property. My room was on the top floor of the hotel, 1711. There are four elevators which turned out to be the right amount with always one elevator being here within seconds. Literally they are almost always empty and you can go from ground floor to floor 17 without stopping anywhere. Only at rush hour (10am) the elevator had to stop more than once. Having arrived on the too floor the room was just right across the elevators and upon opening the door, I was pleasantly surprised by the fresh smell and new look of the room details. The electricity controls were state-of-the-art with an elegant look and even though the wardrobe was on the small side, it had everything I was looking for. 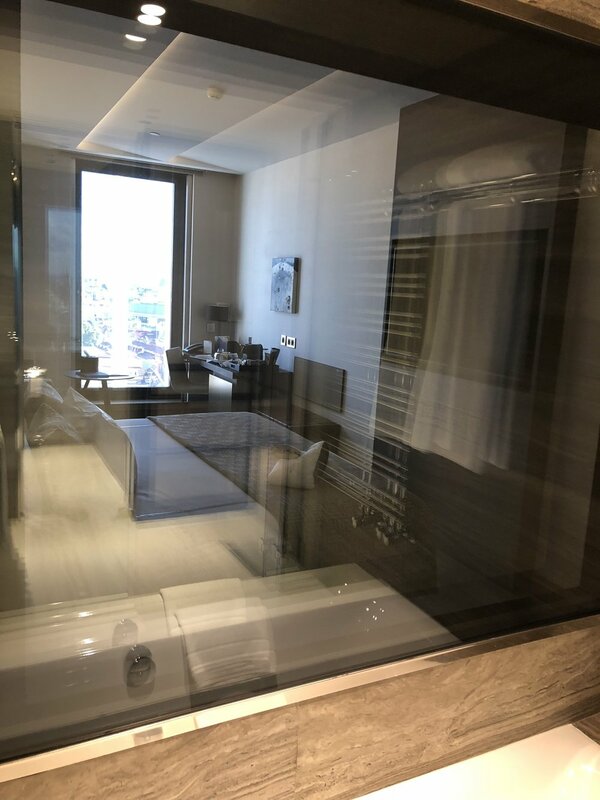 Until proceeding further I found the entrance to the bathroom which features a single vanity desk, separate toilet as well as a walk-in shower situated next to the bath tub that also had a window looking onto the main room. All toiletries were by L’Occitane and they also provide the entire array of guest amenities including comb, toothbrushes and shaving kit. When I headed into the bedroom I was speechless by the generous layout including the new and vast double bed, chic bedside tables with lovely wall scones, writing desk with international power sockets and minibar as well as a sofa that could be turned into an extra bed, making the hotel also family-friendly. The main highlight of the room however - beside the magnificent bed - was the floor-to-ceiling window boasting an magnificent view of the old town. While I wouldn’t have minded to have the entire front to be of glass, I found it a bit unpleasant that the windows are curved. This ended up that the photos taken from the room looked like you edited it with a childish filter rather than as stunning as it should look from that location. Another plus of the room was the partly complimentary minibar with soft drinks and beer (free of charge) plus a selection of snacks and hard alcohol on a surcharge. They even refilled the soft drinks on the next day which I really appreciated. Sometimes, too much technical amenities come with a price, so we had to call the front desk once we realized that the television was not working at 10 pm. A guy showed up within 5 minutes and repaired everything. I found the tv menu quite good and they had a good selection of channels. In comparison to the other hotel we stayed before, VP Plaza Espana Design offered a turndown service coming along with excellent chocolates and a bath mat in front of the bed. 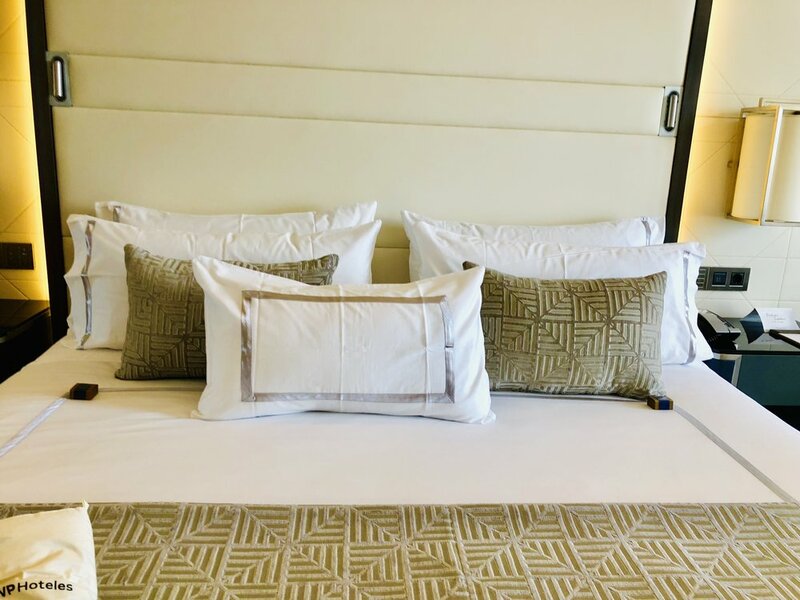 Even though I don’t necessarily need a second housekeeping service, I still like if the bed is prepared and the curtains are shut once coming back from dinner. Since we both had the longest lunch in life behind us, we were eager to visit the hotel’s spa on the first floor and luckily we had complimentary access to it. Beside three treatment rooms and a fitness room, there is a vitality pool and a sauna for a bit of relaxation after an exhausting day of shopping in Salamanca or Avant-Garde districts. While the pool is definitely not for swimming (which I already knew pre-arrival), it is great to just enjoy the warm water and a bit of bubbles overlooking the busy Plaza Espana. Unfortunately they just have four chairs next to the pool rather than relaxation loungers inviting for a sleep. Generally the spa was on the small size but had a nice appeal and fresh look plus lovely to have a view and not being underground. Actually the VP Espana Plaza is known for their 12th floor rooftop restaurant and bar which we also wanted to see. Hotel guests have to walk outside onto the street in order to access the elevator leading to the restaurant. This makes a hotel guest look like an external guest with no benefits, however we still would have gotten a table on Saturday night which was a plus. After having had a look onto the facilities up there, we decided to walk along Gran Via an opt for a burger at Five Guys considering we already paid 800 euros for lunch and were in for something low-key. Having the Gran Via at your footsteps is really a great USP - as the pool and rooftop restaurant is. The next morning, after a heavenly sleep, we were ready to explore breakfast. I am one of these travelers that enjoy a warm welcome and a nice chat when first approaching a staff member, however at VP Plaza Espana they were rather trying to explain me Felix would need to pay separately for breakfast since the front desk has put one person in the system only. A call later everything turned out to be fine and we could proceed to the table. To sum it up the buffet was vast and is definitely one of the biggest ones in entire Madrid plus considering the amount of rooms totally appropriate. Sure, they cannot do a la carte breakfast, but if the offered quality is not coming up to the expectations, it is a bit sad. While it was lovely that they offered Eggs Benedict, it was disappointing when we had to figure out that the Sauce Hollandaise tasted like a cheap supermarket version. Also the ham and cheese sandwich was a total disappointment with the bread being a bit heated but the cheese still being super cold as the ham. We had to put the sandwich into the toaster again to make it more tasty. Other than that the Iberico ham was really good as the cheeses were. I liked the two juices including the passion fruit and orange juice plus I appreciated that they offer Cava for breakfast. 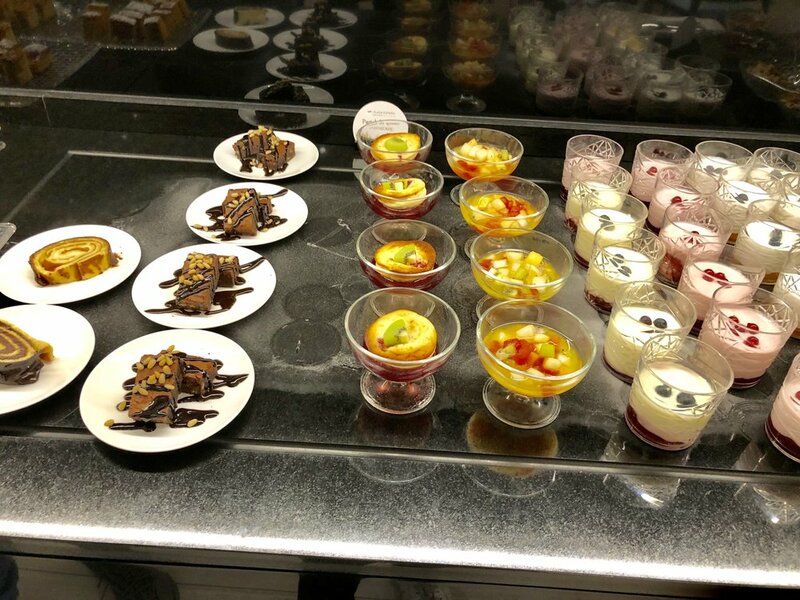 Another lovey touch was the selection of brownies, churros and yoghurts nicely presented on small plates or crystal glasses. I think that once you are familiar to the products there is something for every kind of guest (even for us haha). Overall the VP Plaza Espana is a solid five star hotel in the real heart of Madrid with a very stylish hardware. Unfortunately the software is not on par (yet) but there is still potential to change this in the upcoming months. 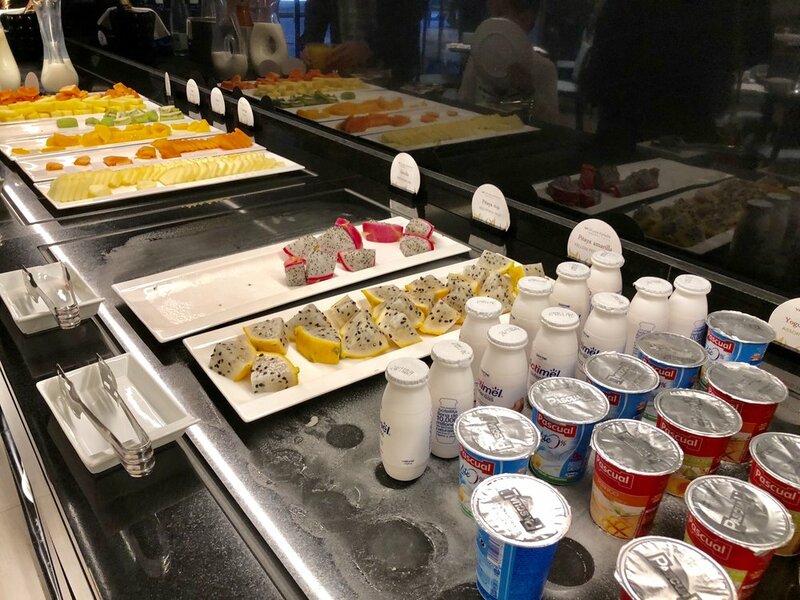 Considering it is a brand new hotel, there are always some small mistakes at the beginning which they have to come over in the next months of operating. I might consider staying at the hotel again but then in summer to enjoy the magnificent rooftop pool which actually has a glass bottom looking onto the 12-storey atrium with the huge art piece. 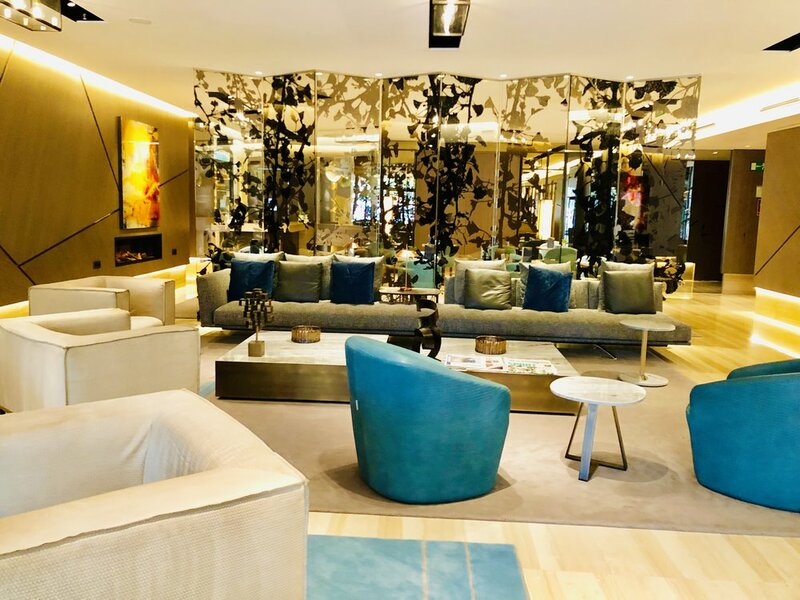 If you score a great deal at the hotel, there is absolutely no doubt in staying there and bear in mind the location is a 10/10 for all Madrid first timers. 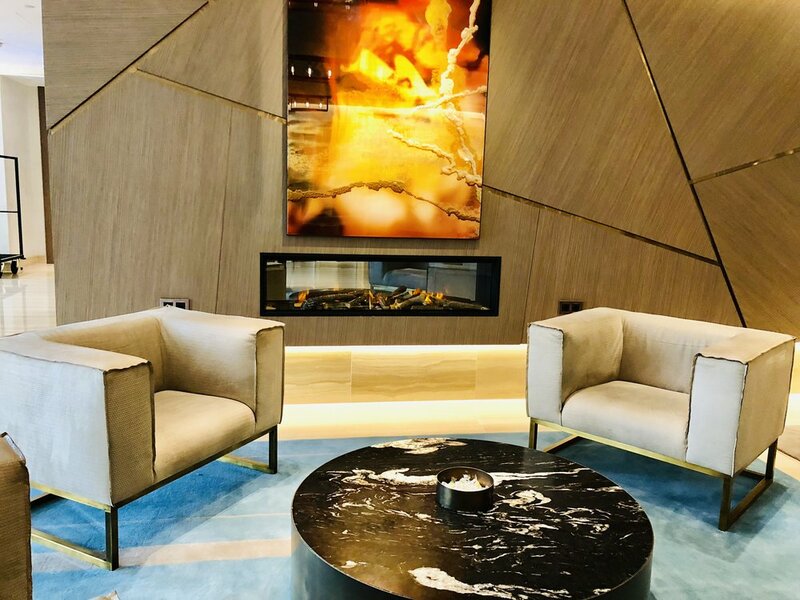 We were guests of the VP Plaza Espana Design Madrid and the stay was arranged thanks to KPRN network, however all above written expresses our own opinion and has not been influenced.